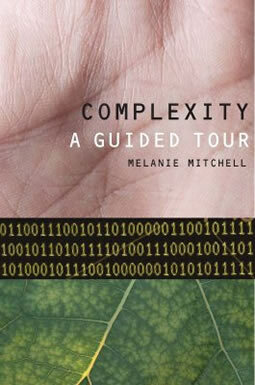 If you are curious about the current scientific revolution, in which science’s traditional reductionist approach is being superseded and long standing disciplinary boundaries are being fudged, then I can recommend Melanie Mitchell’s Complexity: A Guided Tour. It provides a very good overview of current scientific knowledge on how large-scale, complex, organised and adaptive behaviour emerges from simple interactions amongst myriad individuals. Mitchell explains, in language the general reader will understand, how new scientific theories are being developed to understand the workings of complex systems, both within nature and society. Although there will be times when you might feel that you just can’t get your mind around some of it, persevere, it is worth it. There are a number of rare insights into the links between science and society, as when Mitchell describes current developments in the field of genetics. She shows how scientific certainties are now in a constant state of flux, as the science of genetics is becoming more complex following the mapping of the human genome and how epigenetics is explaining how a gene’s function can change without modifying its DNA sequence (by using genetic switches). While this helps to explain why the beaks of finches, found by Darwin on the Galápagos Islands, were able to vary so rapidly in evolutionary terms, what is really interesting is how this is impacting on the economic and regulatory foundations of the international biotechnology industry, because these new discoveries are questioning the functions of genes patented by the industry. Unfortunately, Mitchell doesn’t recognise the obscene fact of the commodification of human genes by the biotechnology industry to make profits in the first place. Despite this shortcoming Complexity: A Guided Tour should be praised for recognising the fact that there is a relationship between science and society by exploring the philosophical implications of how information takes on purpose (or meaning) in complex systems. While Mitchell recognises this as an important philosophical question, I believe, she limits the potential of her understanding of what is happening by avoiding the one philosophical method which is really capable of understanding how consciousness evolves – materialist dialectics. Although this might be understandable for someone who is part of the American scientific establishment, Marx and Engels developed the science of materialistic dialectics to understand “things and their representations, ideas, in their essential connection, concatenation, motion, origin, and ending”  and they were clear that nature was the living proof of materialist dialectics. Although Mitchell briefly mentions the palaeontologist and evolutionary biologist Stephen Jay Gould, the materialist dialectical approach of scientists like Richard Levins and Richard Lewontin, as demonstrated in their The Dialectical Biologist, is missing. Nonetheless, the book still offers many great insights and none more than in relation to the science of network thinking which considers the “relationships between entities rather than the entities themselves”, especially when these contain what are called small world networks. These have small average path lengths between nodes and relatively few long distance connections, relative to the total number of nodes, and what is important about them is that this allows information to travel quickly within these networks without incurring the high cost of creating and maintaining reliable long distance connections. Another insight worth further investigation is the research being done into scale free networks which appear to have a great deal of resilience when random nodes and links are deleted, allowing them to maintain their basic properties as a large scale free network. One such example is the World Wide Web. Mitchell explains how models of small world networks and scale free networks have opened up the idea of network thinking to many different scientific disciplines and has established network science as a field in its own right. What scientists are now trying to do is understand the dynamics of information and other qualities of networks in which the nodes and links continually change in both time and space. Next to the mysteries of dynamics on a network – whether it be epidemics of disease, cascading failures in power systems, or the outbreak of revolutions – the problems of networks that we have encountered up to now are just pebbles on the seashore.